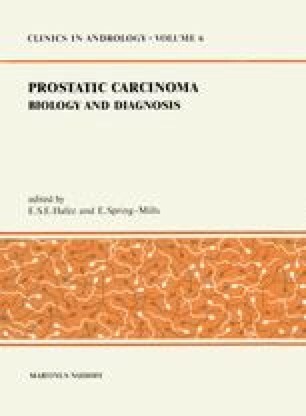 Attempts to correlate prostatic disease, particularly cancer of the prostate (CaP), with the levels of biochemical substances found in the serum, prostatic tissue and fluid and bone marrow of the involved patients have been a preoccupation of urologists, biochemists and immunologists. Even though a physician may suspect the presence of prostatic enlargement due to benign prostatic hyperplasia (BPH) or the presence of CaP, many cases of CaP cannot be confirmed by needle biopsy. One goal of the search for reliable prostatic markers for cancer of that organ is the development of biochemical assays for the early detection of CaP which may corroborate the need for further diagnostic tests such as biopsy of prostatic tissue. Another use for prostatic marker is to help determine whether a patient with CaP is responding to therapy. A further goal, still sought, is to identify a marker(s) for early detection of CaP.